As Houston's premier fine jewelry store, we have been providing the Houston area with the finest quality Diamond Engagement Rings , Certified Loose Diamonds, Diamond and Gemstone Designer Jewelry, Fine Timepieces, and Giftware since 1866. Every piece of jewelry we sell has been hand selected based on the latest trends, finest quality materials and expert craftsmanship All loose diamonds we sell are GIA certified and laser inscribed as well as being verified with our state of the art diamond grading equipment. We are pleased to offer on site jewelry & watch repair as well as our Gold Buying Service. Stop in today and allow our knowledgable sales staff to assist you in choosing the perfect piece of jewelry you are looking for. 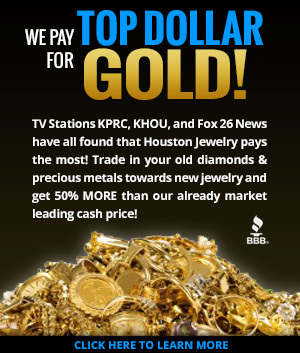 We are your #1 fine jewelry store in Houston, TX. Now in its fifth generation of management of Houston Jewelry, the Donsky-Solomon family has the knowledge, experience and know-how to provide you, our valued customer, with the utmost in service and satisfaction. With an inventory that includes the highest end manufacturers of elegant designs, you can be sure you’ve come to the right place. The Finest Loose Diamond Dealer in Houston! With certified loose diamonds that are beautiful, durable & rare, you can be sure that Houston Jewelry’s loose Diamonds will retain their value for years to come. Check out our Certified Loose Diamond page for more information on color, clarity, cut, channel setting, baguette, fancy cut, pave, solitaire six prong style setting. In addition to our traditional conflict free diamonds, We now offer some of the finest quality independently certified, laboratory created diamonds available. Be sure to check out our world renowned collection of British Crown Jewels on display. 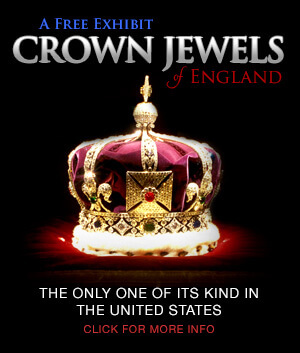 With a permanent free exhibit of life size replicas of the Crown Jewels of England, Houston Jewelry's amazing and unique display will be sure to enchant you. Stop by today or click here for more details!